Home Tags Posts tagged with "sujuk"
Almayass, the recently-opened New York offshoot of a Beirut restaurant, claims to serve Lebanese-Armenian cuisine. And this is rather exciting, because as far as I know, the Armenian restaurant contingent in NYC had dwindled to a grand total of one (Sevan in Bayside). And if you’re wondering about the Lebanese/Armenian association, you can find out more here about the history of Armenians in Lebanon. Obviously, I’m not going to write Red Alerts for just any joint that serves kebabs, so I chose to focus on the small selection of dishes that were explicitly Armenian, either because the menu said so, or because they were recommended as such by our waiter. 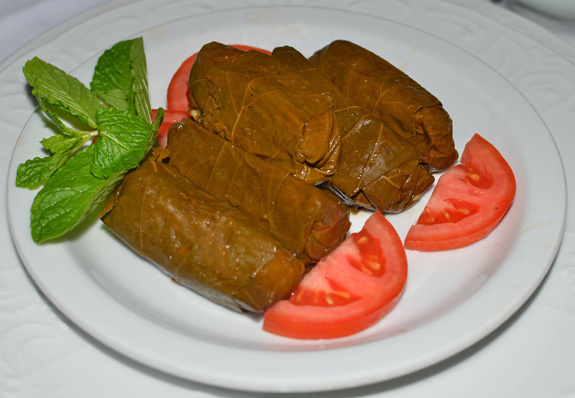 The dolma on the menu were stuffed eggplant, but there was also a dish named sarma that my non-Lebanese self would call grape-leaf dolma. We went with the sarma. The very moist and tasty filling consisted of rice and a vegetable mixture in which I think I recognized tomato, eggplant, and cabbage, with lemon juice. This was a great improvement from the all-too-common beat-up, brownish leaves stuffed with dry rice. 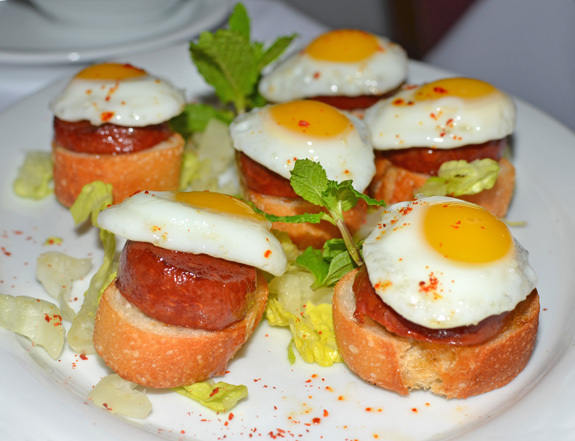 The sudzhuk, a dry, spicy beef sausage, was served on toasted bread and topped with quail eggs. Simple but delicious, the richness of the egg balancing the spiciness of the sausage. I almost didn’t notice the dismal yellow lettuce on the plate! The basterma was also a success. 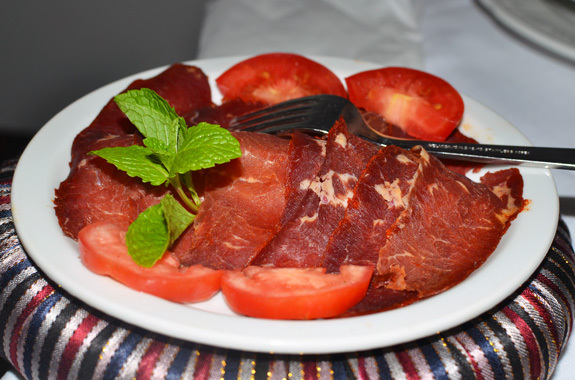 The air-dried, cured beef was pretty well-marbled, salty and spicy as it should be, but not overpoweringly so. It did not sport the thick, reddish spice coating that is the norm and can have an unpleasant taste. We tried several more Lebanese dishes that were generally good but sometimes needed a little tuning. I’d say the Armenian ones were the highlight of the meal.